Looking for an easy dinner recipe? Well, look no further because pitta pockets are one of the simplest suppers to put together. No cooking required (unless you really want to!) and really just a self-assembly job. Pitta pockets are made from a kind of Middle Eastern unleavened yeasted bread called Pitta bread. The word ‘pitta’ derives from a Greek term for a thin bread and that’s exactly what it is. Oval in shape and flat, in the UK pitta bread generally comes in two sizes – either ‘mini’ which are about the size of a small hand- or large, which are slightly bigger than the size of a man’s hand. You can also choose between wholemeal and white pitta breads which are both commonly sold in supermarkets. Why are They Called Pockets? The pitta breads are a little like pockets in that during cooking, the bread rises slightly so that when slit gently along one edge, the two sides of the oval can be prized apart, forming a space between which of course can be filled with lots of yummy things. Filled pitta breads were, and still are, sold hot and fresh as street food in Middle Eastern countries such as Israel where the flat dough is often cooked in front of the customer and served bulging in a paper wrap. To make a pitta pocket, take a pitta bread, then warm by popping into the toaster, grilling, putting into a warm oven or microwaving for a minute or two. If you sprinkle a little bit of cold water on the surface of the bread before putting in the oven or microwave it will keep it soft. The bread will puff up, allowing you to then take a sharp knife and make a slit on one side – or at one of the ends if you prefer – of your pitta bread. You will then find you have a hollow ‘envelope’ to fill with food of your choice. A traditional filling would be to place two or three hot falafel balls in the bread and add shredded lettuce and a raita-type sauce. Falafel is a savoury snack made from chick peas eaten in the Middle East. Raita is a cool sauce dish made with natural yoghurt and cucumber. The mix of the hot and cool together is lovely. Other fillings which work particularly well are strips of warm cooked chicken or turkey, souvlaki (little meatballs), feta cheese, olives, hummus, tofu, sweet peppers, bacon and goat’s cheese and so on. One of the really great things about pitta pockets is that they can be adapted to suit any season. They make super no-fuss barbecue meals, a cooling summer snack with lots of salad or served hot with spicy pork balls, crispy duck or satay chicken, they are a comforting winter filler. 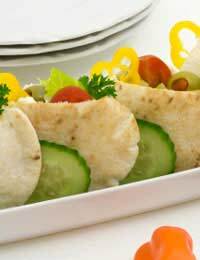 Pitta pockets are also perfect for when you have guests, as they enable people to select their own filling according to taste or diet and provide clean finger-food in that the warm bread is held rather like a wrap or sandwich. No mess, no washing up!